Exams are designed to determine a student’s aptitude in pre-hospital care, focusing on specifics for each of the six categories to assure accreditation is only granted to those students with a satisfactory knowledge of practices. All students seeking accreditation in the three main categories of first-response, EMT-basic and EMT-paramedic must take the appropriate examination and receive a passing score. The computer will not issue a passing grade until it reaches a 95% confidence in the student. This is based on how many questions have been issued verses correct answers. The test will continue until the 95% confidence rate has been achieved. 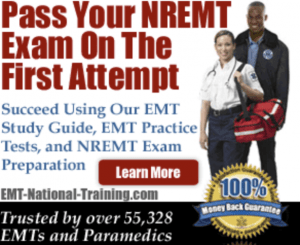 Why is the NREMT exam important? The NREMT exam is important to both the accreditation societies and the American public. High standards have been set for the exam to assure that paramedics and EMT staff are completely competent in all areas of medical care that will be encountered while working. Vital mistakes can be made during the process of delivering a patient to hospital care and post physician that can be costly both financially and in terms of the patients well being. Therefore the NREMT exam has been designed to assure each new emergency response personnel are fully knowledgeable and posses the ability to correctly perform duties. A strong study plan begins with re-reading the materials for an honest understanding of the student’s confidence in each area of the exam. Gather additional review materials and designate specific amounts of time everyday to studying. Begin by reviewing the six main components found on the NREMT exam which will include airway, cardiology, medicine, OBGYN and Pediatric, trauma patients and operations. Allow one to two days per topic for review to begin with and more time can be devoted to specific areas the student determines require more detailed study. Reviews can be done using the textbook from courses and workbooks that coincide with the chapter material. By week two students should acquire additional materials designed specifically for NREMT review. Highly recommended by former students is the ‘PassMedics Paramedic Study Guide’ which can be found in hard copy and e-book format online. Practice exams are also aviable at www.passmedics.com for a small fee. In addition to a working knowledge of the six main categories found on the NREMT exam, each student should spend some time preparing for the actual testing procedure. This many include reading up on some excellent test taking tips such as the ones found on www.ems1.com generated by paramedics, former students and practicing EMTs. It is important for each student to have a plan in place for tackling the actual exam to avoid confusion and frustration. Practice tests will also assist in this process and can be found online at many NREMT specific sites for a nominal fee or in some cases free. Websites such as www.emtprep.com generate multiple online practice tests with questions identical to those found on the National Registry Database. Similar sites include www.test-guide.com for free EMT practice tests. On test day it is important to assure that the student is well rested and does not work the night before. Many former students advise that cramming before the test will decrease chances of passing and any last minute reading should only involve a glance at numbers and medications the student may have trouble remembering. The NREMT exam will issue a pass/fail score based on the number of correctly answered test questions as well as the 95% confidence issued by computer calculation. If a student receives a failing score, the computer will provide feedback concerning areas and questions missed to use for further study. Students are allowed to retake the exam six times before required to retake the paramedic training courses. Three failed attempts and the tester must first complete a 48 hour remedial training course and provide documentation of completion. A 15 day waiting period is required between failed tests to allow for additional preparation time. It is important to use this wait time for a review based on the feedback given after testing to assure that more repeats are not necessary.